Wanting to automate your welcome series emails with SmartrMail? Follow the tasks in this article to help you get started with Welcome Emails. You can automate Welcome Emails to the subscriber lists we automatically import from your e-commerce platform. But you can also set these up for manually created lists. If you want to manually create a list, follow this guide. To start collecting subscribers in your manually created list, you can either use SmartrMail's email collection popup without any code or easily embed our HTML form on your website. Now that you have a list to send to, you can start automating your welcome series emails. In the top header click Auto Emails, and go to the Welcome Emails Tab. To enter the composer, click the New Welcome Email button. Within the composer, you can choose your subject and email title. Then add text and images into the body with links to your store. If you want to include products, you can add them faster with our product lookup. Automatically pull products from your e-commerce store complete with images, descriptions, and links. Welcome emails offering small discounts on first orders have higher conversion rates than welcome emails that don't have any offer. Insert a welcome code from your e-commerce platform using the text block. You can bold the text by highlighting it. Then set a trigger for when you'd like your welcome emails to send. 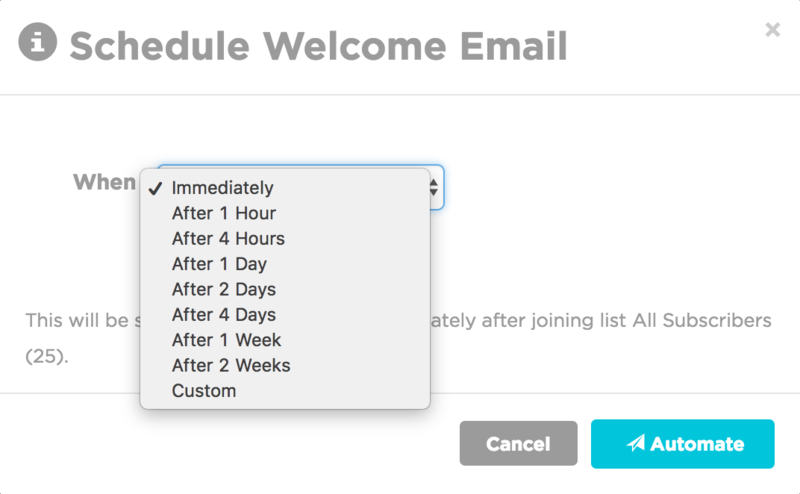 You can trigger the email to send immediately after a customer signs up or choose between hours, days, weeks, or set a custom time. You can automate an unlimited amount of welcome emails with SmartrMail.